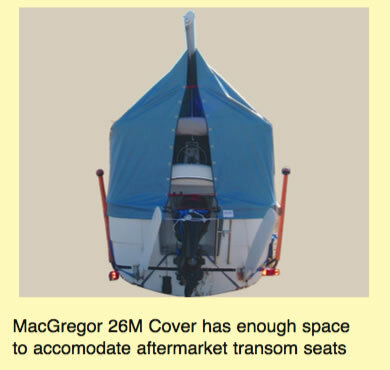 Heavy duty full boat covers are specifically built for the purpose of protecting your boat while being trailered on the highway and while stored with the mast down and for winter storage. Invest 10 minutes covering your boat and save hours of cleaning off road grime, storage sediments & buffing oxidized gelcoat caused by prolonged exposure to the sun, elements and weather. Covers are built of strong, water and U.V. resistant Blue Aquaknot™ and reinforced at specific stress points. With a draw string closure along the skirt and reinforced grommets to tie off lanyards under boat, it can withstand strong wind and stay firmly in place at highway speeds.